What's Up? : 2B shigeki "Summer Vacation"
I go on a trip during the summer vacation. At the moment, that you plan to travel two nights and three days in Hakone. I have been to hot springs in Urayasu ever. And I fell in love. To Hot Springs. Hakone trip, have decided to go to Hakone Kowakien Yunessun. There are certain things that mimic the world's oceans. For example, Dead Sea. 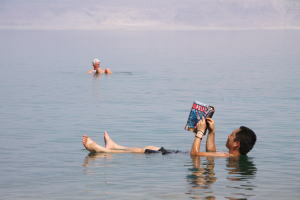 I will be a man fond of reading while floating in the Dead Sea. Do you recommend to do in Hakone? I want to come early summer vacation. I never went to Hakone yet. How did you try to actually go to Hakone?